S. David; purchased April 1939 by (Downtown Gallery, New York); sold 3 May 1939 to Anson Conger Goodyear [1877-1964], New York. Mrs. Cornelius N. Bliss [née Zaidee C. Cobb], New York, at least 1949-1950. (sale, Christie, Manson & Woods, New York, 25 February 1972, no. 178); purchased by John Baskett for Mr. and Mrs. Paul Mellon, Upperville, Virginia; bequest 1999 to NGA. Records of Downtown Gallery, Archives of American Art, microfilm 5609/frames 585-591, microfilm 5574/frame 298 (copies in NGA curatorial files). The painting is listed in the Downtown Gallery records as by William M. Harnett, and was stock number A25 of the Gallery's Harnett paintings. Published by Frankenstein in 1949 as in Mrs. Bliss' collection; she also lent the painting to a 1950 exhibition organized by The Brooklyn Museum. 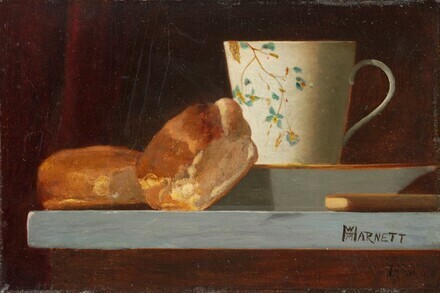 Her husband died 5 April 1949, and it is probable that they owned the painting together before then. John F. Peto, Smith College of Art, Northhampton; Brooklyn Museum; California Palace of the Legion of Honor, San Francisco, 1950, no. 8. Important Information Inside: The Art of John F. Peto and the Idea of Still-Life Painting in Nineteenth-Century America, National Gallery of Art, Washington, D.C.; Amon Carter Museum, Fort Worth, 1983, no. 222, repro. Feast for the Eyes: American Masterworks from the National Gallery of Art, Academy Art Museum, Easton, Maryland, 2008, no cat. Art and Appetite: American Painting, Culture, and Cuisine, The Art Institute of Chicago; Amon Carter Museum of American Art, Fort Worth, 2013-2014, no. 55, fig. 13. Frankenstein, Alfred. "Harnett, True and False." The Art Bulletin 31, no. 1 (March 1949): 46. Frankenstein, Alfred. After the Hunt: William Harnett and Other American Still Life Painters 1870-1900. Rev. ed. Berkeley and Los Angeles, 1969: 184, no. 3.